Taking 4 days in Xian to challenge courage by taking walk on mountain top, to have a glimpse of past of the city by visiting cultural in and around the city. You will be met by our tour guide at Xian airport upon arrival and transfer you back to your hotel. 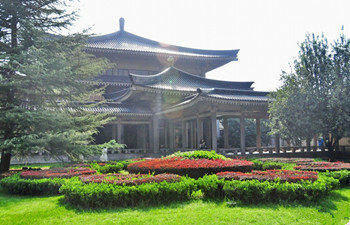 After lunch, first we will visit the Shaanxi History Museum which is near the Big Wild Goose Pagoda. The entire building is in the architectural features of the Tang Dynasty. It is a treasure of the cultural heritage of Shaanxi Province and shows the development of the Chinese civilization. Then visit the Big Wild Goose Pagoda, which was built to store the scriptures and statues brought back by Xuan Zang from India. It’s one of the famous Buddhist pagodas in China. Last transfer you back to you hotel or you can explore the city by yourself if time is available. After the breakfast, our English-speaking tour guide and driver pick up you from the hotel with holding your name. Today’s adventure begins with the most notable stop Terra-Cotta Warriors and Horses. It is known as one of the World Eight Wonders. There are 3 pits all together, where can bring you back to the Qin Dynasty and feel like a Qin soldiers. After lunch, we come back to the downtown and enjoy visiting the Ancient City Wall which is the best preserved and most complete city wall that has survived in China, It is one of the largest ancient military defense systems around the world. It was built in the Ming Dynasty and provides invaluable and worthwhile material for the research of the history and architecture in that period. Today’s tour concludes at the Bell Tower and Drum Tower Square and the nearby Muslim Quarter where various local tourist avenues are available. After the breakfast, our English-speaking tour guide and driver pick you up from your hotel at 8:30am. We will arrive at the Mount Huashan at 10:30am. We would like to suggest you to prepare some food for the whole climbing. The lunch is on your own. We will take a cable car to the North Peak. At the North peak, our guide will leave you for free to enjoy the beautiful mountain scenery. On the top of the mountain, there are several spots, such as the Buddhist and Taoist temples, sculptures and engravings. You will enjoy yourself very much on the 4 peaks. Passing the Gold Lock Pass you can buy a golden lock, and lock it on the iron chains on the Gold Lock Pass which symbolize safety and health. It must be marvelous scenery to see thousands of golden locks on the iron chains. On the Middle Peak (Jade Maiden Peak), you can enjoy its supernatural atmosphere. It must be fantastic and amazing to watch the sunset with your own eyes. Then you will move forward to the East Peak and the South peak and last come to the West Peak. You will have a good treat by the fresh air on the Mount Huashan! Our tour guide will meet you at the North Peak and take the cable car to the foot of the mountain together. At about 17:00pm, the driver will wait for you at the exit gate of mountain and then transfer you back to Xi’an city. After the breakfast, our English-speaking tour guide and driver pick up you from the hotel with holding your name. Then we come to the Yangling Mausoleum of the Han Dynasty，which is the shared Mausoleum area of the fourth emperor of the Han dynasty Liu Qi and his Empress Wang. It is famous because that it is the first complete underground museum with advanced relic protection technology in the world. Last we will transfer you back to the airport according to your flight time.